A Gentlemen's Duel can be far different wherever you go, but in Antiford, it's all written down for your benefit. Duel- An Arranged engagement in combat between two individuals with matched weapons in accordance with agreed-upon rules. In Antiford, matters of high stress and extreme disagreements have been settled with duels since colonial times. The act of dueling stretches back to Paorrian civilizations but also crosses the boundaries of species, as Vibranni and Yeti have also been found to have their own dueling systems in history. Although the practice is beginning to fall by the wayside in many countries, in Antiford, it is still common to see two quarreling men contemplating the act. In Antiford, there are two forms of dueling you can find. 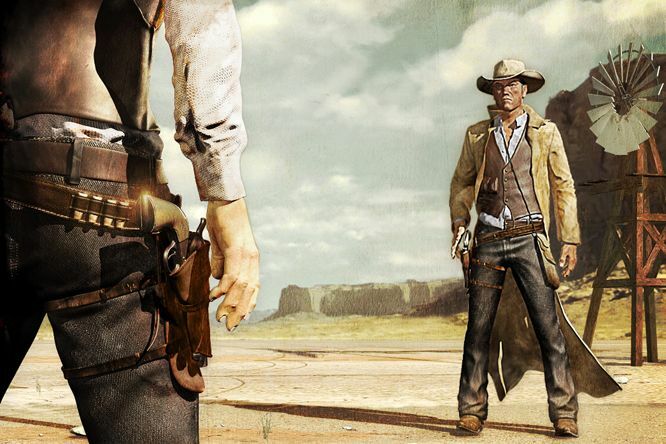 The highly legal and organized "Civilized" duel is probably the most common while a less structured "Frontier" duel has taken hold of the criminal underground and far West in Antiford. The civilized duel has a series or regulations and rules that apply to it, and a course in which the duel must proceed to be protected under the laws. Duels are quite legal, but must follow a precise procedure to ensure fairness and legality of said duel. When older duels were to begin, a challenge must be issued. One gentleman declares the duel and the challenged accepts, in public or private. If the challenged were to decline, no negativity would have come to them besides that perceived by the challenger or any witnesses. However, in the modern Civilized duel, the challenge is little more then a formality. In fact, most challenges are just a way to blow off steam and intimidate the opposition. Officially, the challenge is recognized when the two challengers fill out a duel request form. The paperwork informs both applicants of the laws concerning a duel and reminds them of the risks. The form establishes many things. It establishes who the challenger is (important later) and who the challenged is. There must be two witnesses (one representing either side) who understand that their respected sides have read and agree to the terms of the duel. The initial form waivers the challenger and the challenged from responsibility for the death of the defeated, or any assault related chargers sustained during the duel. The initial Challenge paperwork establishes the weapon, the field, the time, and the combatants. All must be approved by a judge before the actual duel. The beginning paperwork must establish important aspects of the duel for the judge to determine. The Cause is the reason for the duel taking place. The Challenger gets to establish the cause. Common acceptable causes for a duel would be slander, identity theft, murder of a family member/friend, infidelity, or intense political rivalry. However, many excuses has been given in a variety of intensities. The Purse is an ambiguous field detailing the winnings of the duel. The Challenger gets to establish the purse, which the Challenged agrees to. Most duels leave this open, as the "winnings" can be argued as keeping ones life or establishing dominance. However, many famous duels have ended without death (See Points). Things such as business agreements, marital decisions, and money have all been exchanged as end results to duels. The Challenged gets to establish the weapons to the duel. Weapons decide how points are awarded and in what way the duel will be carried out. Weapons could be any object, tool, or weapon that are provided to the combatants. Weapons cannot be proxy fighters, mounts (horses, chanka, stags), or vehicles (Airship, Landship, Steam Bike). The Challenger must sign consent to the weapon choice. Weapons can be easily categorized into these groups. Hand weapons are limited, and mostly consist of bare-handed combat. Fists, Brass Knuckles, and iron gauntlets are generally labeled here. Points are awarded for solid hits on the sides/ribs, chin, cheek, stomach, and throat. The whole thing handles much like a boxing match. Blade weapons are considered any tool with a sharp edge used for stabbing, slicing, thrusting, or hacking at an opponent. The most common weapons used are Rapiers, Swords, Daggers/Knives, and sometimes hand axes. Points are awarded for any hit on the body to varying degrees but major points are for severed limbs, critical cuts (Artery, Throat, groin) or lethal hits. Firearms are relatively new, but are becoming wildly popular. Points are awarded after rounds (both firing shots within 2 seconds of the starter pistol). The combatants stand back to back, walk ten paces, and the the starter pistol is fired and they turn and fire at each other. If a combatant refuses to fire within 2 seconds of the starter pistol, then they cannot fire. The damage is calculated and points are awarded based on body parts or survivability. If both combatants are UNHIT and neither yields, they reload and reset up for another shot, at nine paces. This will continue until they are 2 paces away, in which the match is forfeit. Points are awarded for head shots, gut shots, chest (left or right), limb shots, or near misses. Points are lowered based on how close the combatants are. Other weapons are used, but points and rules are made up on the fly. Such battles have been waged with umbrellas, poisons, and even live Skuttlekovy. The field describes where the duel will take place. In Antiford, duels can take place anywhere outside of city limits with the exception of duel arenas. In Gearford, there is a small enclosed park used for duels. In Astam, a street can be sectioned off for use of a duel. In Whitehaven, several "arena" areas have been set aside, but the judge can also declare a duel a public affair in which they can set aside any public area (street, building, road) for use of a duel. Time established when the duel will take place. However, it is not just date and time, it also established how long a duel will take place. Till death, point total, or yield are common time limits given on a challenge. The Challenger is allowed to propose a time but last decision usually goes to the judge who approves the duel. When it comes time for the duel, the combatants meet at the Field. The Challenger, the Challenged, the two witnesses (or more), a Police Liaison assigned to the duel, and a medical professional are all on the scene. The police liaison then re-establishes the agreement to the duel by re-reading the challenge in its entirety. The weapons are then distributed and the duelers take their stance (dependent on weapons and established rules). 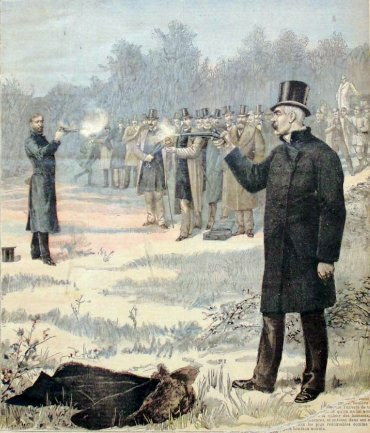 A starter pistol is used to signify the start of the duel, and it begins. Depending on the pre established rules, the duel then begins. Meanwhile, the medical professional and the police liaison tally points based on the pre-defined system based on weapon type. A final starter pistol shot can usually signify the end of a duel. When one is killed or the winner is declared based on points, the duel is ended. The medical professional tends to any wounds that were obtained during the duel or pronounces the loser dead. A death certificate or yielding form is then filled out by all those present. If the duel has ended in the death of one or both of the duelers, then the death certificates are signed and the body(ies) are released to the family/friends of the deceased. Sometimes dueling results are published in the papers, a fairly new occurrence sweeping Antiford. If there are no deaths and one yields, then a victor is announced and yielding paperwork is drawn up. Yielding paperwork shows that the yielder has forfitted to the victor. The purse is given to the victor. The yielding paperwork also establishes that any further retaliation will be treated as attempted murder. The two go their separate ways, a temporary restraining order keeping them apart for 13 days after the duel. Then they may resume normal living. As with all things there's legal ways of doing things, there's illegal ways of doing things, and there's not doing things. In Antiford, they have worked out a fourth, grey area of doing things. The Frontier dueling system is the newest form of the duel to arise in Antiford. As the name suggests, this form of dueling as developed in the more undeveloped west of the Istoki Desert and North settlements. This form relies more on honor then the Civilized one, or at least at skin level it does. When a quarrel breaks out between two individuals, one can challenge another to a duel. As long as the challenge is made with a group of people witness to it then it is legitimate. If the challenged accepts, it is practically binding. The duel is now broken into Challenger and Challenged, just like in a normal duel. The Challenger declares, with more then three witnesses, a time and a place for the duel. The Challenged then chooses the weapon type: Firearm, sword, or bare knuckles (in order of popularity). Combatants are in charge of providing their OWN weapon. On the day of the duel the Challenged and Challenger are responsible to ensure a crowd of witnesses for two reasons. One, for witnesses to be present and two, so they can have support to ensure the other dueler doesn't run out. The combatants take their mark and prepare for a fight. They follow similar rules to the formal duel, only all Frontier duels go to the death or until one yields, no point systems. The duel ends one of two ways. Either one is killed, and the victor is the survivor, or one yields. Once one has yielded, the victor decides to either kill them outright or humiliate them and claim victory. In the event of a death, the victory is produced with some documentation and the witnesses all sign a statement for the duel. The victor is locked up overnight while the paperwork is proceed and the death certificate is done up. Afterwards, they are often released and continue on with their daily lives. If there is evidence, however, of foul play, cheating, or assistance in the victory, the duel outcome is then treated like a murder. If no one is killed at the end of the duel, the one who yields is taken to a medical professional. After some time healing, they are then given the opportunity to leave town (believed to be offered for their own safety/honor). However, they have no legal obligation to leave or stay, they just cannot place charges. In actuality, the Frontier duel is illegal in Antiford. However, the phony paperwork and crowd acceptance of it means very rarely is it ever taken action upon by Police Officers on tour or any judge in Antiford. It is, however, not practiced in the East or elsewhere in the world in this manner due to its seemingly barbaric nature. In, say, Argenstrath, a duel by this method would be considered a murder or a lynching. Whitehaven is the only "developed" city in Antiford who "allows" this method of duel. Most of the time, Bobbies will turn a blind eye to it with bribes or fake documentation and false signatures are drawn up at a later time to justify the impromptu duel.